Arrive at Sea-Tac after ride with parking lot shuttle driver who spent the entire drive gleefully describing to me all of the explosives he created and detonated for July 4th. Why he thought I was an explosives kind of girl, I don’t know. Get through long, slow moving curbside check-in line, then security and I’m off to Denver on a comfortable 2 ½ hour flight. Check in to Marriott City Center and take off for Convention Center to pick up my badge and tote bag. On the way, meet up with some old friends from UCLA Law Library and meet some new UCLA law librarians as well. Make arrangements for dinner with my UCLA friends and head over to Blake Street for a delicious dinner at India House. Stuff myself with a vegetarian’s nightmare, Tandoori Mixed Grill and head back with the group to the Convention Center for the Opening Event in the Korbel Ballroom. The Ballroom was huge, allowing plenty of room to walk around and sample all of the different desserts available without knocking into people along the way. I’m not a big dessert person so instead I visited the bar stations which were well-stocked with beer, wine and even a signature cocktail: “The AALL”, a yummy peach martini. By 9:00 p.m. I was running out of steam and ready to call it a night. Back to the hotel for a good night’s sleep. Up early to meet a group of law librarian runners outside the Convention Center at the big blue bear sculpture. The Hein Fun Run took a break this year, so two Boulder runner/librarians, David Selden (National Indian Law Library) and Karen Selden (UC Boulder Law Library), were wonderful enough to organize a fun, casual run along the Cherry Creek Multiuse Recreation Path which runs right through downtown Denver. Back to hotel to shower and eat an awesome Egg White and Sundried Tomato breakfast sandwich from Bruegger’s Bagels with a Starbucks Venti Americano. Clean and fueled for the day, I was off to the Convention Center to hit the vendors. Checked everything out: LexisNexis, Westlaw, Bloomberg, etc. Made sure to see demo of WestlawNext for mobile applications so that I could be entered into hourly iPad drawing. (Did not win.) Saw vendor rep who looked like Jude Law. Skip Opening Session for World Cup final. Bloomberg had the game showing on their big flat screen and a few people gathered around to watch. Was able to watch up until regular time finished and then had to leave for a Westlaw focus group. Missed out on the most exciting part of the match but did participate in an interesting discussion. Saw Jill Allyn there, and she invited me to join Mort Brinchmann and her for dinner at the Wynkoop Brewing Company. Enjoyed a delicious blue cheese burger, fries, and of course, a beer (Wynkoop’s B3K Schwarzbier). Go home and get to bed early. Flip through channels on TV and find one that is devoted to a WestlawNext infomercial. Yikes. Three mile run then Bruegger’s Bagels and Starbucks. I’m loving my new routine and the warm, sunny summer mornings along the running path. Head to Convention Center to hit the programs. Attend informative session on library statistics: Lies, Damned Lies, and Reference Statistics. Listen to presentation on why and how to collect statistics using online programs like Desk Tracker, Gimlet and Libstats. Next up was In PKI We Trust: Authenticating Our Future. Got more information on the specifics of how pdf documents are authenticated and why authentication is so important. After that, time for lunch with ALM where they revealed the results of their 2010 Law Librarian survey. Lunch was advertised as a “light lunch” but it was really hearty, with a buffet selection including beef skewers, salmon, mac and cheese with chili peppers, different salads and blueberry crumble a la mode. Yum! I was marveling over the statistic that the average Am Law 200 librarian billed around 300 hours a year. My sinus-clogged head kept thinking that averaged out to about sixty hours a week. Then I took some Sudafed and realized later that the real average is around six hours a week. Duh. Barbara Holt, my tablemate at lunch, will certainly not be nominating me for LLOPS Treasurer anytime soon. Back to the hotel to meet up with my cousin Tracy who lives in the Denver area. Went to Marlowe’sfor happy hour and to catch up. Tracy and I hadn’t seen each other for close to fifteen years! 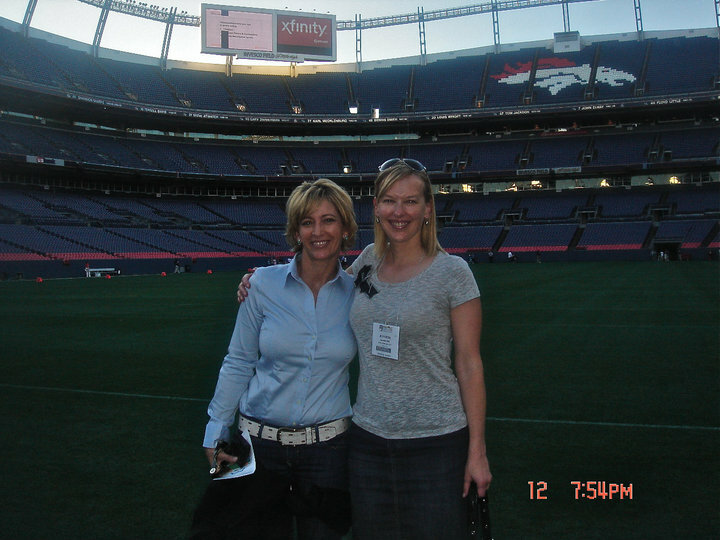 After that, I took her to the Hyatt where we caught a shuttle bus to the Thomson Reuters Customer Appreciation Party at Invesco Field. I thought she needed to see law librarians cut loose, and people did not disappoint. We hung out on the field a bit and then went inside to eat nachos and watch people dance to live music. Had a great time! No run this a.m., as I made plans to go running later with Tracy. Sleep in a bit, shower and head out. Stop by Einstein Bros. Bagels on the way to Convention Center for a change of pace. Head to program Looking Up From the Bottom: Bankruptcy Law and Research. Learn about the different types of bankruptcy cases and the types of documents within the cases that can provide background information when you want to know more about a company. Back to the Convention Center for one last program, the PLL-SIS Program: 60 Minute Recap of the Change as Opportunity Summit. That one was held in the same room as the competitive intelligence program, so I got there very early to secure a seat. Listening to the recap made me wish I had gone to the summit, as it sounds like it was a worthwhile meeting of the minds. There is already a plan in place for a summit in Philadelphia next year. I don’t know that I’ll be able to attend the full conference again next year, but I might think seriously about trying to at least attend the summit, even if it’s on my own dime. I think it would be a very beneficial meeting and learning experience. Back home—a couple of pounds heavier (running three miles a day wasn’t enough to keep up with all of the good food and drink I consumed) with a little bit more knowledge under my belt and a few new professional connections. Had a great conference experience with a good mix of education, networking and social activities. Thank you very much, LLOPS, for providing me with the grant to make it happen. Oooh wow that Summit sounds very interesting…and the India House sounds yummy. So long til lunch!